Cable protector plates for wood studs. Standard type/nongangable. Protects nonmetallic sheathed cable or raceway type wires running through wood studs from accidental nail, screw, or drill penetration. Also applies to plumbing to protect nonmetallic piping. No nails required. Pregalvanized steel construction for added corrosion protection. No additional hardware required, just position and hammer down spurs. UL, cULus Listed. Secures service entrance cable. Pointed offset legs drive in straight, will not split wood. High quality carbon steel for durability and easy nailing. Fastens wires, cables, hose and ducts. DoubleLock design ensures 50 percent more tensile strength than industry standards. Flexible Nylon material allows cable ties to remain serviceable through temperature ranges of 32 to 185 degrees Fahrenheit. Recognized under component program of UL E125869. Meets flammability classification UL 94 V-2. General purpose electrical insulating tape, good dielectric strength. 7 mils thick. UL Listed and CSA Certified. Fastens wires, cables, hose and ducts. DoubleLock design ensures 50 percent more tensile strength than industry standards. Flexible Nylon material allows cable ties to remain serviceable through temperature ranges of 32 to 185 degrees Fahrenheit. Recognized under component program of UL E125869. Meets flammability classification UL 94 V-2. Fastens wires, cables, hose and ducts. DoubleLock design ensures 50 percent more tensile strength than industry standards. Flexible Nylon material allows cable ties to remain serviceable through temperature ranges of 32 to 185 degrees Fahrenheit. Recognized under component program of UL E125869. Meets flammability classification UL 94 V-2. For wire tying, bundling and other fastening uses. Meets flammability classification UL94V-2. Tight, square-wire spring threads directly onto conductors for fast connections with no slip. Tightens without ratcheting, easily removed for repeat usage on same size combination or larger. Fluted shell surface permits a firm grip for easy finger-tight connections. Thermoplastic shell shields against environmental extremes. Flame-retardant properties resist heat distortion up to 221 degrees Fahrenheit. Superior flash-over protection. High-dielectric shell features deep skirt design to prevent exposure of bare wire. Buttress threads screw into wire insulation. For copper to copper connections only. Fastens wires, cables, hose and ducts. DoubleLock design ensures 50 percent more tensile strength than industry standards. Flexible Nylon material allows cable ties to remain serviceable through temperature ranges of 32 to 185 degrees Fahrenheit. Recognized under component program of UL E125869. Meets flammability classification UL 94 V-2. Easy-on, easy-off without tools. Wings are knurled for a surer grip and offset from the centerline for greater twisting leverage. Easily removed for repeat usage on same size combination or larger. Expandable square-wire plated spring instantly adjusts to the shape and size of the splice for a vibration-resistant connection. Tough thermoplastic shell shields against environmental extremes. Flame-retardant, non-porous and non-corrosive shell resists surface cracking and chemical action. Temperature rating: 221 degrees F. Superior flash-over protection. High-dielectric shell features deep skirt design to prevent exposure of bare wire. Buttress threads screw into wire insulation. Copper to copper connections only. cULus Listed. Easy-on, easy-off without tools. Wings are knurled for a surer grip and offset from the centerline for greater twisting leverage. Easily removed for repeat usage on same size combination or larger. Expandable square-wire plated spring instantly adjusts to the shape and size of the splice for a vibration-resistant connection. Tough thermoplastic shell shields against environmental extremes. Flame-retardant, non-porous and non-corrosive shell resists surface cracking and chemical action. Temperature rating: 221 degrees F. Superior flash-over protection. High-dielectric shell features deep skirt design to prevent exposure of bare wire. Buttress threads screw into wire insulation. Copper to copper connections only. cULus Listed. Easy-on, easy-off without tools. Wings are knurled for a surer grip and offset from the centerline for greater twisting leverage. Easily removed for repeat usage on same size combination or larger. Expandable square-wire plated spring instantly adjusts to the shape and size of the splice for a vibration-resistant connection. Tough thermoplastic shell shields against environmental extremes. Flame-retardant, non-porous and non-corrosive shell resists surface cracking and chemical action. Temperature rating: 221 degrees F. Superior flash-over protection. High-dielectric shell features deep skirt design to prevent exposure of bare wire. Buttress threads screw into wire insulation. Copper to copper connections only. cULus Listed. Easy-on, easy-off without tools. Wings are knurled for a surer grip and offset from the centerline for greater twisting leverage. Easily removed for repeat usage on same size combination or larger. Expandable square-wire plated spring instantly adjusts to the shape and size of the splice for a vibration-resistant connection. Tough thermoplastic shell shields against environmental extremes. Flame-retardant, non-porous and non-corrosive shell resists surface cracking and chemical action. Temperature rating: 221 degrees F. Superior flash-over protection. High-dielectric shell features deep skirt design to prevent exposure of bare wire. Buttress threads screw into wire insulation. Copper to copper connections only. cULus Listed. For wire tying, bundling and other fastening uses. Meets flammability classification UL94V-2. Specifically designed for making positive ground connections. Connectors feature the same live-action as WingGard connectors with the added plating protection for corrosion resistance in grounding applications. Contoured, offset wings enable firm ground connections with the twist of a hand. Flame retardant, themoplastic shell resists punctures, cuts, abrasion and corrosion. Connectors have a hole in the tip for ground wire. Solid copper to copper connections only. Nos. 15-095; 19-095 and 25-095: minimum 2 #14, maximum 4 #12 wire connections. Two-wire staples fasten 2 and 3 conductor non-metallic cable. SIZE: 1/2" x 1" - For 2 conductor (No. 12 and No. 14) NM cable. SIZE: 9/16" x 1-1/4" - For 3 conductor (No. 10 and No. 12) NM, BX, UF and other cable. Black PVC electrical tape is UL Listed to 600 volt. 7.5 mil. thickness and a temperature rating up to 80 degrees Celsius/176 degrees Fahrenheit. Elongation of 200 percent allows tight wrapping and sealing. For snap-in splicing of low-voltage AWG wire without prior stripping. 75 degree Celsius temperature rating. Clamshell. Two-wire staples fasten 2 and 3 conductor non-metallic cable. SIZE: 1/2" x 1" - For 2 conductor (No. 12 and No. 14) NM cable. SIZE: 9/16" x 1-1/4" - For 3 conductor (No. 10 and No. 12) NM, BX, UF and other cable. Temporarily bundle items with quick addition or removal of wires and hoses. Re-use and re-tighten. Fastens wires, cables, hose and ducts. Flexible nylon material, -40 to 185 degrees Fahrenheit. UL Listed, RoHS Compliant. For use up to 600 volts. PVC film coated with a non-corrosive rubber based adhesive. Resistant to water, oils, acids, alkalis and other corrosive chemicals. Lead free. Temperature range from 32 to 176 degrees F. Used to repair frayed wiring, splice wiring, protect wire nut connections, resurface and insulate hand tools and general purpose maintenance and repair. 7 mil. thick. UL Listed and CSA Certified. For use up to 600 volts. PVC film coated with a non-corrosive rubber based adhesive. Resistant to water, oils, acids, alkalis and other corrosive chemicals. Lead free. Temperature range from 32 to 176 degrees F. Used to repair frayed wiring, splice wiring, protect wire nut connections, resurface and insulate hand tools and general purpose maintenance and repair. 7 mil. thick. UL Listed and CSA Certified. Fastens wires, cables, hose and ducts. DoubleLock design ensures 50 percent more tensile strength than industry standards. Flexible Nylon material allows cable ties to remain serviceable through temperature ranges of 32 to 185 degrees Fahrenheit. Recognized under component program of UL E125869. Meets flammability classification UL 94 V-2. For self-locking ties up to size 46-315 and all mounting ties up to size 48-315. For self-locking ties up to size 46-315 and all mounting ties up to size 48-315. PVC film coated with a non-corrosive rubber based adhesive. Resistant to water, oils, acids, alkalis and other corrosive chemicals. Lead free. Temperature range from 32 to 176 degrees F. Used to repair frayed wiring, splice wiring, protect wire nut connections, resurface and insulate hand tools and general purpose maintenance and repair. 7 mil. thick. UL Listed and CSA Certified. For use up to 600 volts. PVC film coated with a non-corrosive rubber based adhesive. Resistant to water, oils, acids, alkalis and other corrosive chemicals. Lead free. Temperature range from 32 to 176 degrees F. Used to repair frayed wiring, splice wiring, protect wire nut connections, resurface and insulate hand tools and general purpose maintenance and repair. 7 mil. thick. UL Listed and CSA Certified. Use on NM, BX, UF and other electrical cables. Made from high carbon steel. Cable protected by polyethylene insulation. Two-wire staples fasten 2 and 3 conductor non-metallic cable. SIZE: 1/2" x 1" - For 2 conductor (No. 12 and No. 14) NM cable. SIZE: 9/16" x 1-1/4" - For 3 conductor (No. 10 and No. 12) NM, BX, UF and other cable. For use up to 600 volts. PVC film coated with a non-corrosive rubber based adhesive. Resistant to water, oils, acids, alkalis and other corrosive chemicals. Lead free. Temperature range from 32 to 176 degrees F. Used to repair frayed wiring, splice wiring, protect wire nut connections, resurface and insulate hand tools and general purpose maintenance and repair. 7 mil. thick. UL Listed and CSA Certified. For use up to 600 volts. PVC film coated with a non-corrosive rubber based adhesive. Resistant to water, oils, acids, alkalis and other corrosive chemicals. Lead free. Temperature range from 32 to 176 degrees F. Used to repair frayed wiring, splice wiring, protect wire nut connections, resurface and insulate hand tools and general purpose maintenance and repair. 7 mil. thick. UL Listed and CSA Certified. Fasten bundles, hoses, ducts, etc. to panels or other surfaces. Use number 10 screw eye to position and secure bundled harnesses. Flexible nylon material allows cable ties to remain serviceable through temperature ranges of -40 to 185 degrees Fahrenheit. 50 pound tensile strength. Black ties are UV protected. Recognized under component program of UL E125869. Meets flammability classification UL 94 V-2. Commercial grade 7-mil polyvinyl chloride insulating tape, flame retardant and provides mechanical protection with minimum bulk. Excellent resistance to abrasion, moisture, acids, copper corrosion and varying weather conditions. UL Listed and CSA Certified. Silicon bronze for copper to copper. UL Listed. For metallic and non-metallic cording and cable. Constructed of high-grade injection molded polyethylene cradles and zinc-plated nails. Provides toughness, high dielectric strength and longevity. Smooth saddles hold wire securely while preventing damage. Use on NM, BX, UF and other electrical cables. Made from high carbon steel. Cable protected by polyethylene insulation. Vinyl insulated shank with .250" x .032" tab. 75 degree Celsius temperature rating. Quick and reliable crimp-type wire connections. Vinyl insulated shank with .250" x .032" tab. 75 degree Celsius temperature rating. For easy crimp splicing. Insulated copper conductor rated to 600 volt maximum. Temperature rating of 167 degrees F maximum. Clamshell package. cULus Listed. Quick fastening and guiding of wires. Wires easily snap in or out of two usable sides. Use to secure Christmas light sets, sound system wires, etc. Holds category 5 cable for datacom. For securing speaker, telephone, bell and other low-volt wire. Polyethylene saddle won't rust, rot or deteriorate. Zinc-plated nail resists rust and corrosion. 1 nail per staple. Dives in with a hammer. UL Listed. U-shaped staple fastens audio speaker and bell wire, insulated cradle protects wire. U-shaped staple fastens audio speaker and bell wire, insulated cradle protects wire. Two-wire staples fasten 2 and 3 conductor non-metallic cable. SIZE: 1/2" x 1" - For 2 conductor (No. 12 and No. 14) NM cable. SIZE: 9/16" x 1-1/4" - For 3 conductor (No. 10 and No. 12) NM, BX, UF and other cable. Secures service entrance cable. Pointed offset legs drive in straight, will not split wood. High quality carbon steel for durability and easy nailing. Vinyl insulated copper. Rated at 600 volt maximum. Temperature rating of 167 degrees F. UL Listed. With spacer bar silicon bronze, electro-tin plated. For aluminum to aluminum, copper to aluminum, copper to copper. Range for equal main and tap 1/16 copper. Two-wire staples fasten 2 and 3 conductor non-metallic cable. SIZE: 1/2" x 1" - For 2 conductor (No. 12 and No. 14) NM cable. SIZE: 9/16" x 1-1/4" - For 3 conductor (No. 10 and No. 12) NM, BX, UF and other cable. GB 20-101 General Purpose Ring Terminal, 22 - 18 AWG, 600 V, Insulated, Red? Quick and reliable crimp-type wire connections. Vinyl insulated copper. UL Listed. Quick and reliable crimp-type wire connections. Vinyl insulated copper. UL Listed. For use over electrical tape splices. Matted finish provides the best gripping surface available. Use to wrap grips on hand tools. Protects hoses, wire and cables from cuts, abrasions and UV wear. Corrugated for added flexibility. Split down the center for wire breakout where needed. Black. Zinc plated steel. Nylon fully insulated, rated at 600 volts. .250" x .032" tab. 105 degree Celsius temperature rating. Card contains male and female disconnects. Dimensions: 3/8" stud x 2-3/8" length. Multi-range copper to copper connections only. Allows automatic or manual installation without stress whitening or distortion. Use 5/16" socket for H1. Square wire spring grabs and holds wires for secure connections. Long skirt covers stripped wires. Rated at 600 volt maximum and at 1000 volt maximum in lighting fixtures, luminaries and signs. Colored cable ties fasten wire for easy bundle identification. DoubleLock design ensures 50 percent more tensile strength than industry standards. Flexible Nylon material allows cable ties to remain serviceable through temperature ranges of -40 to 185 degrees Fahrenheit. Recognized under component program of UL, E125869. Meets flammability classification UL 94 V-2. Colored cable ties fasten wire for easy bundle identification. DoubleLock design ensures 50 percent more tensile strength than industry standards. Flexible Nylon material allows cable ties to remain serviceable through temperature ranges of -40 to 185 degrees Fahrenheit. Recognized under component program of UL, E125869. Meets flammability classification UL 94 V-2. Assorted fluorescent colors include: blue, orange, green, pink and yellow. 8 inch length, 75 pound tensile strength. Rated at 600 volt maximum, 167 degrees F. UL Listed. Quick and reliable crimp-type wire connections. Vinyl insulated copper. UL Listed. For metallic and non-metallic cording and cable. Constructed of high-grade injection molded polyethylene cradles and zinc-plated nails. Provides toughness, high dielectric strength and longevity. Smooth saddles hold wire securely while preventing damage. For metallic and non-metallic cording and cable. Easy to install; drive both zinc plated nails together without splitting wood. Recessed nail heads for minimum exposure. Smooth saddle (3/8" width) prevents damage to insulation. High grade, injection molded polypropylene resists rot, rust, deterioration and effects of extreme temperature; non-conductive for safe and secure cable fastening. Tight, square-wire spring threads directly onto conductors for fast connections with no slip. Tightens without ratcheting, easily removed for repeat usage on same size combination or larger. Fluted shell surface permits a firm grip for easy finger-tight connections. Thermoplastic shell shields against environmental extremes. Flame-retardant properties resist heat distortion up to 221 degrees Fahrenheit. Superior flash-over protection. High-dielectric shell features deep skirt design to prevent exposure of bare wire. Buttress threads screw into wire insulation. For copper to copper connections only. Tight, square-wire spring threads directly onto conductors for fast connections with no slip. Tightens without ratcheting, easily removed for repeat usage on same size combination or larger. Fluted shell surface permits a firm grip for easy finger-tight connections. Thermoplastic shell shields against environmental extremes. Flame-retardant properties resist heat distortion up to 221 degrees Fahrenheit. Superior flash-over protection. High-dielectric shell features deep skirt design to prevent exposure of bare wire. Buttress threads screw into wire insulation. For copper to copper connections only. Colored cable ties fasten wire for easy bundle identification. DoubleLock design ensures 50 percent more tensile strength than industry standards. Flexible Nylon material allows cable ties to remain serviceable through temperature ranges of -40 to 185 degrees Fahrenheit. Recognized under component program of UL, E125869. Meets flammability classification UL 94 V-2. Assorted fluorescent colors include: blue, orange, green, pink and yellow. 8 inch length, 75 pound tensile strength. For securing speaker, telephone, bell and other low-volt wire. Polyethylene saddle won't rust, rot or deteriorate. Zinc-plated nail resists rust and corrosion. 1 nail per staple. Dives in with a hammer. UL Listed. Two-wire staples fasten 2 and 3 conductor non-metallic cable. SIZE: 1/2" x 1" - For 2 conductor (No. 12 and No. 14) NM cable. SIZE: 9/16" x 1-1/4" - For 3 conductor (No. 10 and No. 12) NM, BX, UF and other cable. For wire tying, bundling and other fastening uses. Meets flammability classification UL94V-2. Quick and reliable crimp-type wire connections. Vinyl insulated copper. UL Listed. Vinyl insulated copper. Rated at 600 volt maximum. Temperature rating of 167 degrees F. UL Listed. For metallic and non-metallic cording and cable. Constructed of high-grade injection molded polyethylene cradles and zinc-plated nails. Provides toughness, high dielectric strength and longevity. Smooth saddles hold wire securely while preventing damage. For snap-in splicing of low-voltage AWG wire without prior stripping. 75 degree Celsius temperature rating. Clamshell. Quick and reliable crimp-type wire connections. Vinyl insulated copper. UL Listed. Colored cable ties fasten wire for easy bundle identification. DoubleLock design ensures 50 percent more tensile strength than industry standards. Flexible Nylon material allows cable ties to remain serviceable through temperature ranges of -40 to 185 degrees Fahrenheit. Recognized under component program of UL, E125869. Meets flammability classification UL 94 V-2. Assorted fluorescent colors include: blue, orange, green, pink and yellow. 8 inch length, 75 pound tensile strength. Vinyl insulated shank with .250" x .032" tab. 75 degree Celsius temperature rating. Used to repair and cover torn wire insulation or to protect and insulate objects such as rope ends, plier handles or terminal connections. Wire identification by color. Shrinks up to half of its original diameter and is temperature rated to 221 degrees Fahrenheit and 600 volt maximum, Underwriters Recognized specification UL 224. Vinyl insulated copper. Rated at 600 volt maximum. Temperature rating of 167 degrees F. UL Listed. Suitable for solid or stranded copper wire. Quick and reliable crimp-type wire connections. Vinyl insulated copper. UL Listed. Quick and reliable crimp-type wire connections. Vinyl insulated shank with .250" x .032" tab. 75 degree Celsius temperature rating. Nylon fully insulated, rated at 600 volts. .250" x .032" tab. 105 degree Celsius temperature rating. Card contains male and female disconnects. With spacer bar silicon bronze, electro-tin plated. For aluminum to aluminum, copper to aluminum, copper to copper. Range for equal main and tap 1/16 copper. Used for indoor and outdoor applications. UV resistant polyethylene saddle. Zinc plated nails. Secures RG-49, RG-59 and RG-6 coaxial cables. With clip-on feature. For easy crimp splicing. Insulated copper conductor rated to 600 volt maximum. Temperature rating of 167 degrees F maximum. Clamshell package. cULus Listed. Vinyl insulated copper. Rated at 600 volt maximum. Temperature rating of 167 degrees F. UL Listed. Quick and reliable crimp-type wire connections. 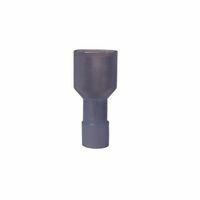 Vinyl insulated shank with .250" x .032" tab. 75 degree Celsius temperature rating. Quick and reliable crimp-type wire connections. Vinyl insulated copper. UL Listed. Quick and reliable crimp-type wire connections. Vinyl insulated copper. UL Listed. Colored cable ties fasten wire for easy bundle identification. DoubleLock design ensures 50 percent more tensile strength than industry standards. Flexible Nylon material allows cable ties to remain serviceable through temperature ranges of -40 to 185 degrees Fahrenheit. Recognized under component program of UL, E125869. Meets flammability classification UL 94 V-2. Assorted fluorescent colors include: blue, orange, green, pink and yellow. 8 inch length, 75 pound tensile strength. Vinyl insulated copper. Rated at 600 volt maximum. Temperature rating of 167 degrees F. UL Listed. For easy crimp splicing. Insulated copper conductor rated to 600 volt maximum. Temperature rating of 167 degrees F maximum. Clamshell package. cULus Listed. For metallic and non-metallic cording and cable. Easy to install; drive both zinc plated nails together without splitting wood. Recessed nail heads for minimum exposure. Smooth saddle (3/8" width) prevents damage to insulation. High grade, injection molded polypropylene resists rot, rust, deterioration and effects of extreme temperature; non-conductive for safe and secure cable fastening. Tight, square-wire spring threads directly onto conductors for fast connections with no slip. Tightens without ratcheting, easily removed for repeat usage on same size combination or larger. Fluted shell surface permits a firm grip for easy finger-tight connections. Thermoplastic shell shields against environmental extremes. Flame-retardant properties resist heat distortion up to 221 degrees Fahrenheit. Superior flash-over protection. High-dielectric shell features deep skirt design to prevent exposure of bare wire. Buttress threads screw into wire insulation. For copper to copper connections only. Quickly installed over entire length of wire run. Excellent for under hood and trailer wiring. Tin-plated seamless copper closed-end crimp connector for use with solid or stranded wire. Vibration resistant, corrosion and chemical resistant. UL listed. Crimp connectors for strong, vibration-resistant permanent connections in branch circuits and fixture wiring. UL Listed. For metallic and non-metallic cording and cable. Easy to install; drive both zinc plated nails together without splitting wood. Recessed nail heads for minimum exposure. Smooth saddle (3/8" width) prevents damage to insulation. High grade, injection molded polypropylene resists rot, rust, deterioration and effects of extreme temperature; non-conductive for safe and secure cable fastening. For snap-in splicing of low-voltage AWG wire without prior stripping. 75 degree Celsius temperature rating. Clamshell. Insulated staples protect and secure Romex, NM, BX and UF. PVC insulation protects cable from damage due to mis-hit and overdriving, prevents a short circuit if wire insulation is damaged. Highly visible color coded for size and application. Card/40. Tin-plated seamless copper closed-end crimp connector for use with solid or stranded wire. Vibration resistant, corrosion and chemical resistant. UL listed. Vinyl insulated shank with .250" x .032" tab. 75 degree Celsius temperature rating. Protects hoses, wire and cables from cuts, abrasions and UV wear. Corrugated for added flexibility. Split down the center for wire breakout where needed. Black. For wire tying, bundling and other fastening uses. Meets flammability classification UL94V-2. For wire tying, bundling and other fastening uses. Meets flammability classification UL94V-2. For wire tying, bundling and other fastening uses. Meets flammability classification UL94V-2. For metallic and non-metallic cording and cable. Easy to install; drive both zinc plated nails together without splitting wood. Recessed nail heads for minimum exposure. Smooth saddle (3/8" width) prevents damage to insulation. High grade, injection molded polypropylene resists rot, rust, deterioration and effects of extreme temperature; non-conductive for safe and secure cable fastening. Rated at 600 volt maximum, 167 degrees F. UL Listed. Quickly installed over entire length of wire run. Excellent for under hood and trailer wiring. Single conductor, features high-strength, low-resistance aluminum construction. Accepts wire from number 14 to number 10 gauge AWG stranded, and number 14 to number 2 gauge AWG solid. UL Listed. Card of 2. Blue, UL Listed. Blue, UL Listed. For severe cold temperature applications. Performs from -40 degrees (F/C) to 185 F. Black, 50lb tensile strength. Enhanced UV protection and UL Listed for indoor and outdoor applications from -4 F to 185 degrees F (-20 C ? 85 degrees C). UL Type 21. 2.6" width x .25" length/depth. Made in the USA. GB Wire Disconnector, 16 - 14 AWG Conductor, Full Insulation, Vinyl Insulation, 600 V, 1/4 in Female Tab Connection, Blue, 3-3/4 in Overall Length, 1.88 in Overall Width, 0.63 in Overall Depth, 167 deg F, cULus Listed Fastens wires, cables, hose and ducts. Flexible nylon material, -40 to 185 degrees Fahrenheit. UL Listed, CSA Certified, RoHS Compliant. Fastens wires, cables, hose and ducts. Flexible nylon material, -40 to 185 degrees Fahrenheit. UL Listed, CSA Certified, RoHS Compliant. Easy and fast, strip and push conductors into connectors to make reliable, secure connections. Simplified insertion and compact size helps in tight locations. Clear polycarbonate housings have color-coded side panels for connection verification and identification. Corrosion-resistant stainless steel springs restrict wire pullout, yet corrections are possible with a simple left-right twist and pull. Continuity test point for easy voltage checks. Rated at 600 volt maximum in building wire and at 1000 volt maximum in lighting fixtures and luminaries. Copper-to-copper connections only. Dimensions: 3/8" stud x 2-3/8" length. Tubing shrinks under heat application to insulate wiring up to half its diameter (finished). Also useful for repairing cords and covering tool handles. Flame retardant. Resists common fluids and solvents. Shrink temperature: 250 degrees F. 2 to 1 shrink ratio. 4" length. UL Listed, meets CSA requirements. More tensile strength than standard ties, resistant to degradation by ultraviolet rays. UL Recognized. Hardened nails can penetrate cement block, mortar or plaster surfaces. For cable TV and other hard-surface installation. Plastic cradle provides added protection to cable jackets. Freeze resistant. UV protected. (Black). Secures RG-49, RG-59 and RG-6 coaxial cables. PCS-1600 has clip-on feature. Tubing shrinks under heat application to insulate wiring up to half its diameter (finished). Also useful for repairing cords and covering tool handles. Flame retardant. Resists common fluids and solvents. Shrink temperature: 250 degrees F. 2 to 1 shrink ratio. 4" length. UL Listed, meets CSA requirements. Easy and fast, strip and push conductors into connectors to make reliable, secure connections. Simplified insertion and compact size helps in tight locations. Clear polycarbonate housings have color-coded side panels for connection verification and identification. Corrosion-resistant stainless steel springs restrict wire pullout, yet corrections are possible with a simple left-right twist and pull. Continuity test point for easy voltage checks. Rated at 600 volt maximum in building wire and at 1000 volt maximum in lighting fixtures and luminaries. Copper-to-copper connections only. Used to repair and cover torn wire insulation or to protect and insulate objects. Includes total of 8 pieces in sizes of 1/8", 3/16" and 1/4" inside diameter before shrinking. For securing speaker, telephone, bell and other low-volt wire. Polyethylene saddle won't rust, rot or deteriorate. Zinc-plated nail resists rust and corrosion. 1 nail per staple. Dives in with a hammer. UL Listed. Tubing shrinks under heat application to insulate wiring up to half its diameter (finished). Also useful for repairing cords and covering tool handles. Flame retardant. Resists common fluids and solvents. Shrink temperature: 250 degrees F. 2 to 1 shrink ratio. 4" length. UL Listed, meets CSA requirements. Tubing shrinks under heat application to insulate wiring up to half its diameter (finished). Also useful for repairing cords and covering tool handles. Flame retardant. Resists common fluids and solvents. Shrink temperature: 250 degrees F. 2 to 1 shrink ratio. 4" length. UL Listed, meets CSA requirements. Tubing shrinks under heat application to insulate wiring up to half its diameter (finished). Also useful for repairing cords and covering tool handles. Flame retardant. Resists common fluids and solvents. Shrink temperature: 250 degrees F. 2 to 1 shrink ratio. 4" length. UL Listed, meets CSA requirements. Tubing shrinks under heat application to insulate wiring up to half its diameter (finished). Also useful for repairing cords and covering tool handles. Flame retardant. Resists common fluids and solvents. Shrink temperature: 250 degrees F. 2 to 1 shrink ratio. 4" length. UL Listed, meets CSA requirements. Tubing shrinks under heat application to insulate wiring up to half its diameter (finished). Also useful for repairing cords and covering tool handles. Flame retardant. Resists common fluids and solvents. Shrink temperature: 250 degrees F. 2 to 1 shrink ratio. 4" length. UL Listed, meets CSA requirements. Tubing shrinks under heat application to insulate wiring up to half its diameter (finished). Also useful for repairing cords and covering tool handles. Flame retardant. Resists common fluids and solvents. Shrink temperature: 250 degrees F. 2 to 1 shrink ratio. 4" length. UL Listed, meets CSA requirements. Indoor/outdoor self cutting cable tie, twist tail zip tie, 50lb tensile strength. Small cutting blade designed into the head of each tie. .17" width x .055" depth. Indoor/outdoor self cutting cable tie, twist tail zip tie, 50lb tensile strength. Small cutting blade designed into the head of each tie. .17" width x .055" depth. For metallic and non-metallic cording and cable. Constructed of high-grade injection molded polyethylene cradles and zinc-plated nails. Provides toughness, high dielectric strength and longevity. Smooth saddles hold wire securely while preventing damage. Malleable non-conductive compound for sealing of electrical raceway connections from air, noise and moisture. For metallic and non-metallic cording and cable. Constructed of high-grade injection molded polyethylene cradles and zinc-plated nails. Provides toughness, high dielectric strength and longevity. Smooth saddles hold wire securely while preventing damage. Easy-on, easy-off without tools. Wings are knurled for a surer grip and offset from the centerline for greater twisting leverage. Easily removed for repeat usage on same size combination or larger. Expandable square-wire plated spring instantly adjusts to the shape and size of the splice for a vibration-resistant connection. Tough thermoplastic shell shields against environmental extremes. Flame-retardant, non-porous and non-corrosive shell resists surface cracking and chemical action. Temperature rating: 221 degrees F. Superior flash-over protection. High-dielectric shell features deep skirt design to prevent exposure of bare wire. Buttress threads screw into wire insulation. Copper to copper connections only. cULus Listed. For applications to all aluminum wire leads to prevent oxidation and shorting. Also prevents corrosion of aluminum conduit joints. Squeeze tube. Tight, square-wire spring threads directly onto conductors for fast connections with no slip. Tightens without ratcheting, easily removed for repeat usage on same size combination or larger. Fluted shell surface permits a firm grip for easy finger-tight connections. Thermoplastic shell shields against environmental extremes. Flame-retardant properties resist heat distortion up to 221 degrees Fahrenheit. Superior flash-over protection. High-dielectric shell features deep skirt design to prevent exposure of bare wire. Buttress threads screw into wire insulation. For copper to copper connections only. Fastens bell, speaker, telephone and other small wires securely along walls, baseboards. Peel off backing. Use on NM, BX, UF and other electrical cables. Made from high carbon steel. Cable protected by polyethylene insulation. For securing speaker, telephone, bell and other low-volt wire. Polyethylene saddle won't rust, rot or deteriorate. Zinc-plated nail resists rust and corrosion. 1 nail per staple. Dives in with a hammer. UL Listed. UV resistant polyethylene saddles, zinc plated nails. Used for inside and outside applications. Clip-on feature enables hands-free installation. Secures multiple RG-59, RG-59. For metallic and non-metallic cording and cable. Constructed of high-grade injection molded polyethylene cradles and zinc-plated nails. Provides toughness, high dielectric strength and longevity. Smooth saddles hold wire securely while preventing damage. Rated for 600 volt copper only. Single hole lugs, easy to install with screwdriver, wrench or pliers. 3/8" bolt size.